How did Americans across the country experience the period of Reconstruction differently? How did their experience influence their perceptions of Reconstruction policies and the government and society of the United States following the Civil War? 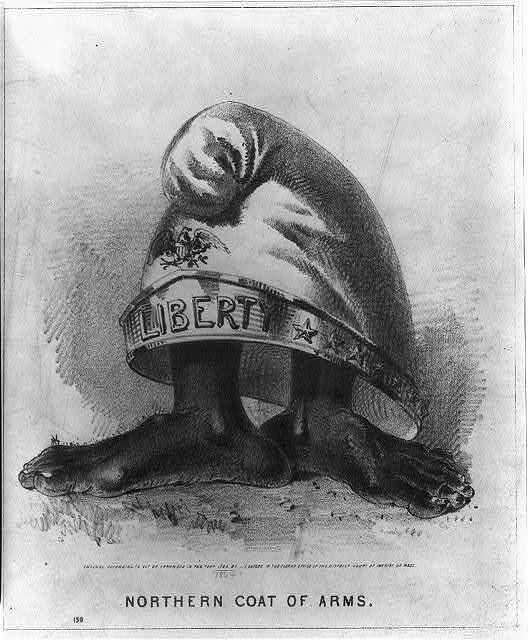 In what ways are political cartoons useful in exploring how people understood Reconstruction? Are political cartoons a good primary source? In the initial stages of developing this lesson, I had the idea that I might want to focus primarily on political cartoons for this lesson. There are so many available from this time period, and so many with such vivid imagery that allow students to engage in analysis with very little background knowledge. As I began to collect documents for this lesson, I was a bit worried that I did not have enough content, and that I might need to include other types of documents. However, because Reconstruction is such a large topic, and because there are so many different lenses through which it can be understood, I found that it was easier to stick with the medium of political cartoons, and engage with them more deeply. In this way, students get the opportunity to engage with the controversy of how to rebuild after a terrible and destructive war that changed multiple aspects of society. In secondary history classes, topics such as Reconstruction are rarely discussed; if they are, very little time is spent uncovering the controversy and complexity of the time period. However, Reconstruction is a period in America’s history that began the current stream of history. By understanding the period following the Civil War, students can begin to see how America’s history has shaped its present. For instance, certain racial policies enacted during Reconstruction played a major role in Americans’ later perceptions of race and racial constructs. It isn’t an easy time period to untangle, certainly another reason why it rarely is at the secondary level. However, giving students primary sources to discuss and explore give them an effective entry point into the time period and the topics surrounding some difficult issues of Reconstruction. At the end of this particular lesson, numerous different activities could be assigned. In the creation of this lesson, I wanted to leave the final product/assignment open because there are so many creative ways to assess understanding of the cartoons and the ideas and values they present. When I discussed possible options for closing assignments for this lesson, various suggestions were given. My favorite assignment idea was to have students create their own political cartoon using similar themes and imagery from the cartoons that they explored in the lesson. This could be done either about Reconstruction issues or even current events. This would allow students to make connections across topics and time periods. 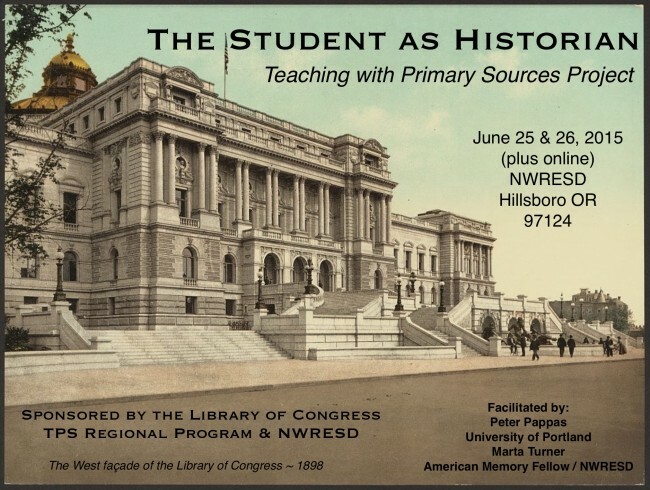 I’m excited to be teaming up with LOC American Memory Fellow, Marta Turner of NWRESD to offer a workshop this summer for 20 Oregon teachers and librarians (grades 4-12). It’s jointly sponsored by the Library of Congress, the TPS Regional Program & NWRESD. Participating teachers will receive $500 stipend at conclusion of the program. We’ll even turn our work into an iBook to be published at iTunes. Notifications will be sent out to participating teachers on May 21st. 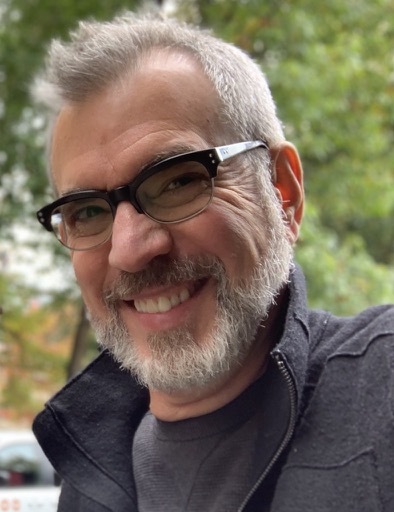 The Library of Congress’s “Teaching with Primary Sources Program” offers instructional strategies to support the effective use of primary sources from the Library’s vast digital collections. This workshop will guide 4th -12th grade teachers through the LOC digital collections to blend historical thinking and literacy skills into an engaging student-centered classroom. Participants will receive a $500 stipend at conclusion of the program. This workshop is limited to 20 Oregon teachers (or librarians). Grade range 4th -12th. Open to public and private school educators. Utilize the web resources of the LOC / TPS. 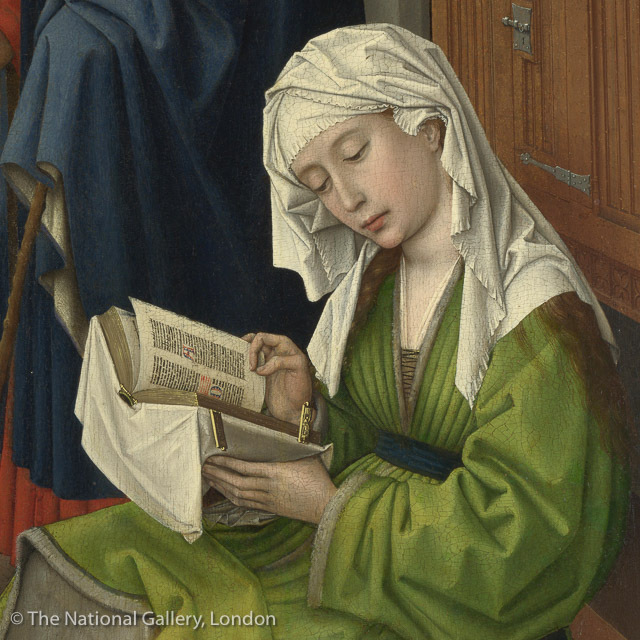 Integrate CCSS close reading strategies into history instruction. Guided practice in designing lessons utilizing the LOC collection. 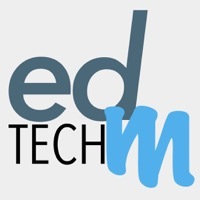 How to use Google tools and other tech resources to teach history in the digital era. Collaborative publication of participant-designed lessons in an online collection and an interactive iBook to be published on iTunes. To maximize workshop interaction, participants will be required to complete a brief preparatory online introduction to the LOC website prior to attending. They will also be asked to develop a preliminary lesson proposals aligned to CCSS ELA literacy standards prior to attending the on site workshop. This preparatory work will commence on June 10th and take an estimated 10 hours to complete. PSU Continuing Education graduate credit is available for this course work. Create a CCSS-aligned lesson using primary resources from the Library of Congress to be shared in workshop publications. Share your lesson with your staff or in another media form. Next, a stock video footage company – Dissolve uses some of its clips to turn Eash’s piece into a meaningless montage of grandiloquent pablum. Ask students to read the full text version of Eash’s original, focusing on word choice, imagery and intent. What is Eash’s “video” selling? You might ask them sketch a rough storyboard to illustrate the text. Discuss the artistic choices made by the video’s creators to illustrate the piece? How does the music and narrator’s voice impact the message? Compare the impact and effectiveness of text, audio and visual. Care to extend the lesson? Use YouTube to find political ads from current or past elections. How to they exemplify the themes raised by Eash? Dissolve has a gallery of all the video clips used in the video. (Hover over them to activate.) 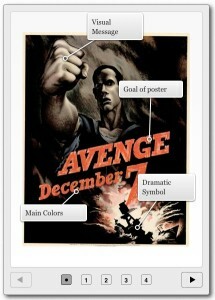 Ask student to select the clips that they feel have the greatest visual impact. Ask them to explain how they might use these clips to tell a story. Show students this actual corporate video and ask them decide if it uses themes noted by Eash. How does the Suncor video compare to the Dissolve satire? Hat tip to Jeff Beer. More of his recommend corporate videos here. Students could re-edit corporate videos to “sell” their own message. 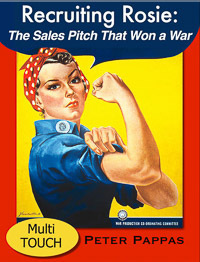 Rosie the Riveter is an American icon that symbolizes the hardworking and self-sacrificing women who left the household and filled the war jobs that turned America into WWII’s “Arsenal of Democracy.” Most people’s visualization of Rosie is based on J. Howard Miller’s poster “We Can Do It!” Lacking copyright protection, it’s everywhere from history textbooks to coffee mugs. (I confess to using it for my cover below) But it’s a much bigger story than Rosie. The era is rich with public domain films, posters, pamphlets and cartoons that provide the contemporary reader with insights into the gender, race and class stereotypes of the period. 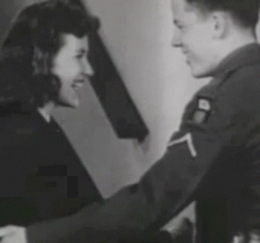 The Homefront series use WWII-era media to document the US government’s propaganda efforts. 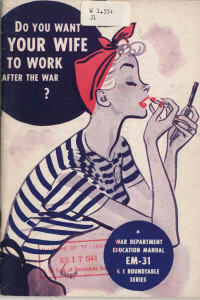 “Recruiting Rosie” focusses on how Washington’s media campaign targeted women – first coaxed them out of their homes to fill the jobs left vacant by men going off to war – then reversed course four years later to convince women to give up their factory jobs to returning servicemen and return to the roles of wife and mother in the home. While there was great diversity in the women who did war work, the media campaign almost exclusively featured white women. Women have always been employed in the workplace, especially minority and lower-income women. They needed little encouragement to move to higher paying war jobs. 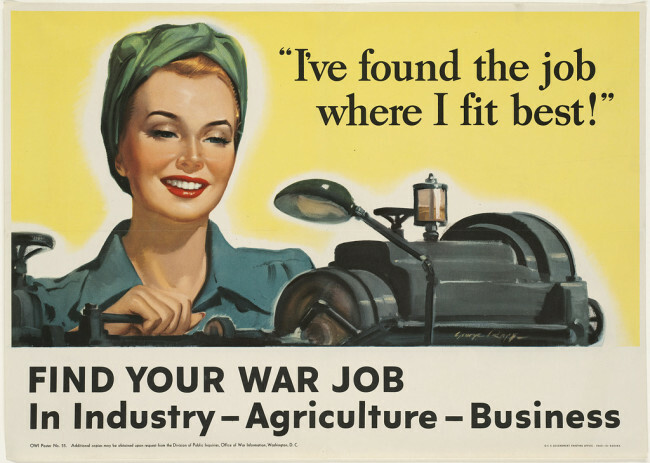 But the demand for wartime labor was so great that the US government launched a propaganda campaign to recruit previously unemployed middle class women into the workplace. There was little reference to women working to make money – not traditionally an acceptable role for married middle class woman. Instead, propaganda was filled with themes of patriotism, sacrifice and duty that depicted war work and military service as fashionable and glamorous. Tip #1. Pick young married women. They usually have more of a sense of responsibility than their unmarried sisters, they’re less likely to be flirtatious, they need the work or they wouldn’t be doing it, they still have the pep and interest to work hard and to deal with the public efficiently. Tip #3. General experience indicates that “husky” girls — those who are just a little on the heavy side — are more even-tempered and efficient than their underweight sisters. 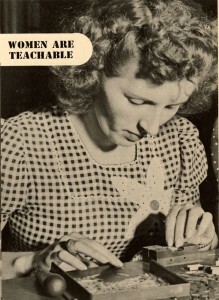 WWII-era middle class couples needed to be convinced that it was acceptable and safe for women to take jobs outside the house and work in a factory. A well-coordinated sales campaign churned out films, new stories and posters that lauded former housewives who readily mastered new industrial tasks. Women were also needed to fill the ranks of many service jobs on the homefront, as well as enlist in the military to replace men who were being moved to the war front. The glamour of travel and the chance to meet men reoccur as dominant themes. 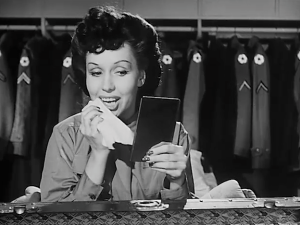 “Its Your War Too” a recruitment film for the Women’s Army Corps (WACs) spends much of the film proving that WACs are fun, feminine, and glamorous – they get to wear makeup, choose their own hairstyles, and travel the world – always with handsome male officers as escorts. WWII required an enormous commitment of American resources and labor. Here at home, millions of families were called upon to make personal sacrifices and work harder to provide the resources needed to fight the war. 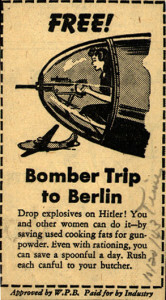 Women were told to give up all luxuries and devote their energies to help win the war. 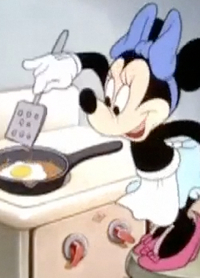 “Recruiting Rosie” documents it all from asking women to volunteer on farms to a 1942 Minnie Mouse cartoon explaining how to recycle used cooking fats for armaments. Will wives be only too glad to give up their strenuous jobs in war plants to return to the job of being homemakers? … If they must or prefer to stay at home again what will be done to make the tasks of homemaking more attractive? 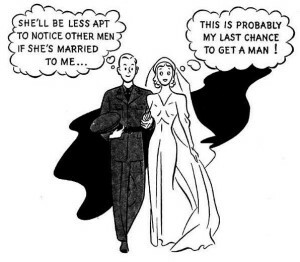 If a woman wants to keep on working after the war what will her husband’s attitude be? If there are no longer jobs enough for everyone should a married woman be allowed to work? Does she have as much right as her husband to try to find the work she wants? 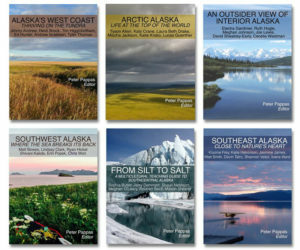 The collection is designed to allow the student to “be the historian” as thought-provoking questions guide them through the archives while building their critical thinking / Common Core skills. 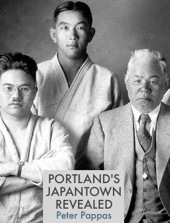 The book also provides web access to the public domain content so they can remix the historic documents into their own projects. 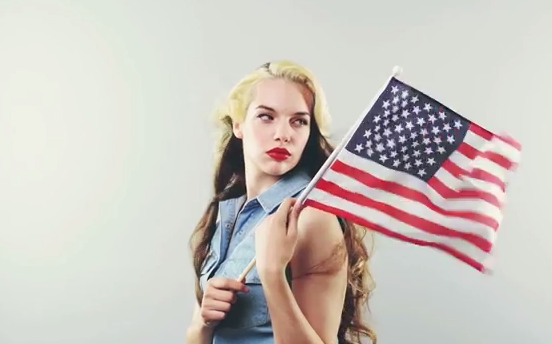 How did WWII impact women and the American family? What opportunities and challenges did the war create for women? 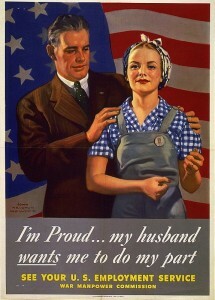 How did the US government craft its propaganda campaign to shape the attitudes of women, their husbands and employers? How do the documents and their WWII-era depictions of women reflect the historic time period?